This section contains all top rail options compatible with our ROUND STAINLESS STEEL POSTS. 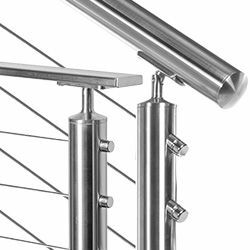 Below we have our Marine Grade Stainless Steel top rails, available either round or flat with compatible connectors, corners, splices and more to create a seamless railing. Or consider our wood options. You can learn more about the species we offer on the WOOD TOP RAIL PAGE. To connect your top rail to your posts, you will need the necessary Post Caps. Once your frame is complete, don't forget Cable Infill and End Fittings! Click here for the Instructions for Assembling the Stainless Steel CableView System. Works for both Round and Square Systems.